Welcome to My Plant-Based Family, Virtual Vegan Potluck Edition. I hope you’re enjoying yourself so far. If you want to start from the beginning check out Vegan Bloggers Unite! There are about 60 bloggers attending so clear your schedule and sit down for a fun time. 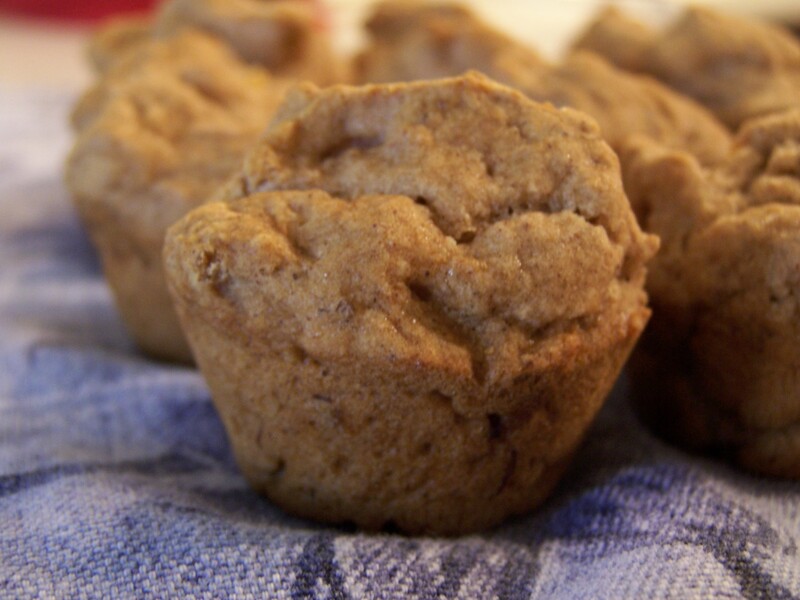 Today I’m bringing Gluten-Free Apple Muffins to the potluck. They are divine and you simply must try one or three! They are moist and delicious, you really can’t tell they are gluten-free or vegan. I recently took them to an event and little children were running up to me asking for more so there are definitely kid approved, a few kids even followed me outside as I was leaving with their cute little hands out. In a medium size bowl mix together the first four ingredients. Add the dry ingredients, baking powder, baking soda, sea salt, and cinnamon. In a large bowl mash banana then add applesauce, sugar, vanilla and water. Mix wet ingredients. Pour dry ingredients into wet ingredients until just mixed. Gently stir in diced apples. Spoon batter into paper lined muffin cups or use a non-stick pan. Bake until toothpick inserted in muffin comes out clean. I baked mini muffins for about 15 minutes and regular sized muffins for about 20 minutes. Don’t stop now, you can go forward or back from here to enjoy the rest of the potluck! I’m still learning about gluten-free baking but I was very happy with these. I tried it with half the sugar and they were not as good, even though I almost always halve the sugar. I only had a slightly ripe banana so I’m sure that influenced the sweetness as well. I’m so glad you’ve made something gluten-free – on my list of things to do in the kitchen and I think I can handle starting with muffins! They look gorgeous! Thank you, Holly! I was a little intimidated to start baking gluten-free but I’me happy with these muffins. I plan to make some gluten-free chocolate chip banana muffins soon! Oh boy – I’ll be waiting for that post! Yummy! I love the gluten free post!!! Thanks, I love your strawberry mint lemonade! Yum! Thanks!!! Isn’t the potluck fun?!? Yes, I was so looking forward to it. I haven’t made it all the way through but I read through a few every chance I get! They look so tasty and healthy – great muffins!! Thank you for the recipe! So nice! I’ve experimented a little bit with gluten-free. Sometimes the result is good other times not so much. I really want to try this recipe…. I’ve noticed that the fee things I’ve baked are only good for about two days. Welcome, I hope you are enjoying it so far! Thank You Lidia! I would love to guest post sometime! Maybe I’ll submit my next gluten-free creation. I’m thinking it will need to be full of chocolatey goodness! This recipe is very easy so I hope you try it. Happy Potlucking! Nothing wrong with a good muffin and some fruit for breakfast! I like food I can eat quickly so I might make a batch of these for breakfasts for the next week. Oh I think you will enjoy these! They taste best the first two days. I haven’t experimented with freezing them yet but I hope to soon. Wow! Now that I am on summer break I plan to do some baking. Thanks for sharing! If only they were full of chocolate…next time! Oh man, I wish I could bake. I’ve had some absolutely amazing gluten-free breads but I can’t make them for the love of me. I’ll have to try this recipe. This one is very easy, you should try it.